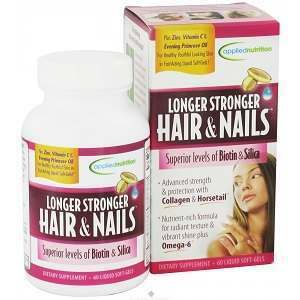 This is a review of the product Longer Stronger Hair & Nails by Applied Nutrition. The manufacturer of this product claims that this product is rich in nutrients and can help you get vibrant hair as well as healthy nails at the same time. Read on to learn more about the ingredients of this product as well as our opinion of whether it is the right product to take for the growth of your hair. Other ingredients include Gelatin, Soy Bean Oil, Glycerin, Purified Water, Soy Lecithin, Titanium Dioxide, Beeswax, Silicon Dioxide, Red Cabbage Juice and Caramel Color. It is recommended that adults take two liquid soft gels daily, preferably with a meal. This product contains an ingredient which has been declared by the State of California to cause reproductive harm as well as birth defects. It should not be used by pregnant and lactating women. In case of an allergic reaction to any of the ingredients in the product you need to contact your doctor immediately. The price of one bottle of this product is listed as $19.99 on the company’s website which includes the cost of shipping and handling. Each bottle contains 60 soft gel tablets which are enough to last a full month. The manufacturer of this product does not offer any return or money back guarantee and so if you are not satisfied with the quality or result of the product then you have no way of getting your money back. The product also doesn’t have any reviews on the website which makes it a questionable purchase. Longer Stronger Hair & Nails by Applied Nutrition is a product that is rich in nutrients and the manufacturer of this product claims that it can provide something that even the best shampoos and conditioners fail to do which is nutrition for your hair from the inside. Not only can it counter the harmful effects of dehydration, pollution and exposure from the sun but it can also be helpful in restoring the vitality of your hair. However, it has an ingredient which has been declared by the state of California as a source of birth defects and reproductive harm. It also has gelatin in it so it is not suitable for vegans and vegetarians. In addition to this the manufacturer also doesn’t offer any guarantee of this product and the fact that there are no reviews of this product on the company’s website is a clear indication that this may not be the best product for you. John Brownstone	reviewed Applied Nutrition Longer Stronger Hair & Nails	on July 29th	 and gave it a rating of 2.5.